My husband is a steak and potatoes, watch football, wear the same shirt for five days (while sweating in the jungle on our honeymoon) kind of guy. He's a man's man. In all his beer drinking, simple eating, sweating glory. And I love that about him. Well, maybe not the same sweaty shirt for five days thing. But with all that manly-ness I expect a few things to come with it, a few "manly" traits that just seem to come with the territory that my manly man might be missing. And that would be a certain knack for household projects, being handy with tools, and a general basic knowledge of cars... Sorry honey, you are great at so many other things! Like walking the dog! But we aren't here to talk about any of those things, we are here to talk about my manly man's unmanly dislike for hot wings and sports bars. That's right. My husband doesn't like buffalo wings. Or watching games at sports bar. And I do. Umm hello, crazy role reversal madness! My brain can't even comprehend. So in an effort to right this wrong and put the universe back to normal, I made buffalo drumsticks at home. Then we has to eat them. And not just any old buffalo drumsticks. 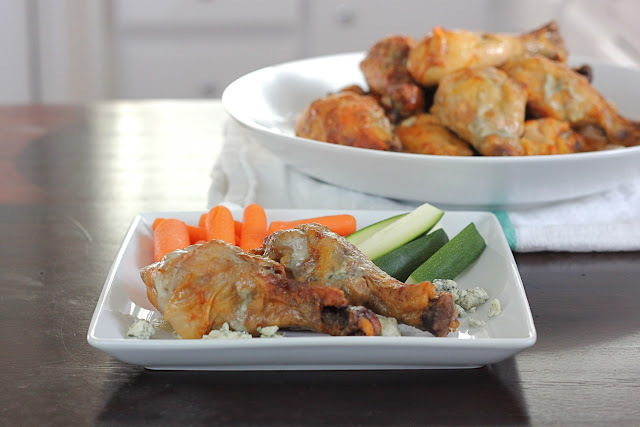 Bleu cheese crusted buffalo drumsticks! In the crock pot! It's like, tasty, easy, delicious, football food overload! And look at me... being all timely and stuff... isn't there a lil ol' football game coming up soon? Hmmm? Make these. And turn your husband into a real man. Wait, did I just say that out loud? In a small bowl mix the salt, paprika, onion powder, garlic powder, and pepper. Sprinkle over chicken coating all sides. In a measuring cup or bowl, whisk together the Frank's Red Hot, melted butter or ghee, and 1/4 cup chicken broth. Pour over the chicken taking care to coat all the chicken legs. Cover crock pot and cook on low for 8 hours. When drumsticks are done cooking, pre-heat broiler. Line a baking pan with tinfoil. Carefully pull drumsticks out of crock pot, they will be meat falling off the bone tender, and place on the tinfoil lined pan. Mix the bleu cheese crumbles and milk in a small bowl still they become a little "gluey". This will help the bleu cheese stick to the drumsticks. Spread about a teaspoon of bleu cheese mixture on to each drumstick. 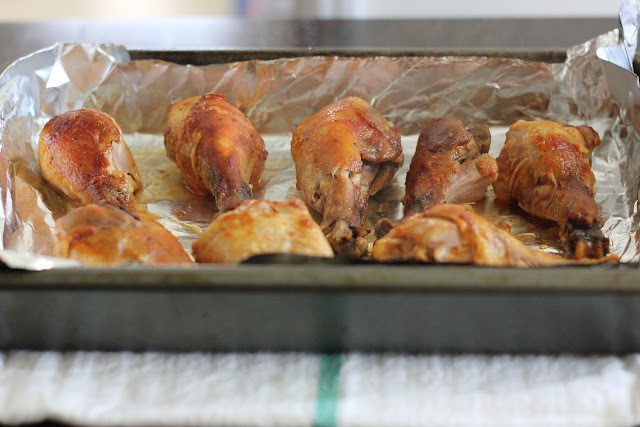 Place pan of drumsticks in the broiler and broil for 3 to 4 minutes, until cheese is melted and skin is crispy. 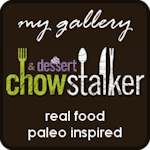 Enjoy with more bleu cheese, carrots, celery, or raw zucchini in my case since I don't like celery. *ghee is clarified butter, the milk fat is rendered from the butter to separate the milk solids and water from the butterfat. I happen to have ghee in my fridge, so I used it. It has a higher smoke point so it is better for frying or sautéing at higher temperatures. It is not at all necessary in this recipe and feel free to substitute regular butter. P.S. 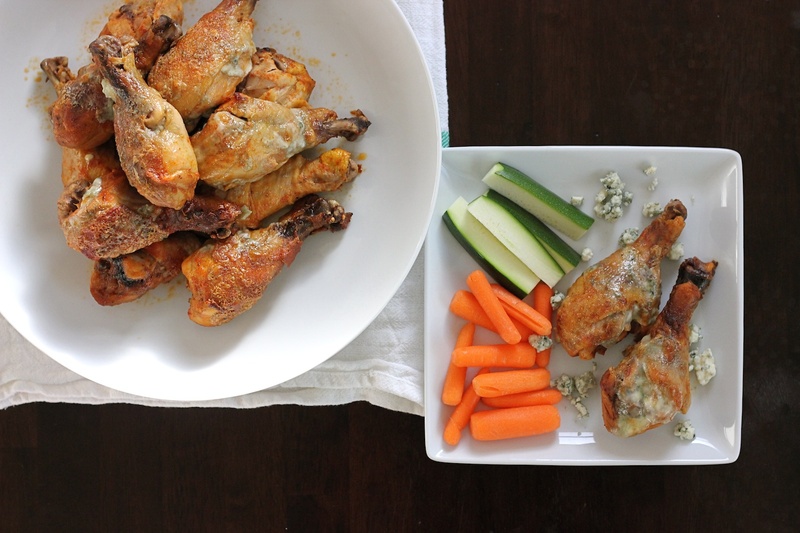 Make these Paleo Buffalo Drumsticks by skipping the bleu cheese crust, but still broiling them for 3 to 4 minutes to get crispy skin. Haha love that role reversal! And that you made buffalo drumsticks in a crockpot! They look so good! This recipe looks so yummy. 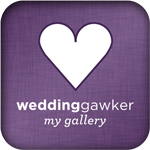 Great pictures, too. Love. Fab post! My mouth is watering! I love bleu cheese! I say this about all your recipes but I'm going to try this one too <3. Kevin and I are going to move back to Valencia! He works there and we want to start a family soon so it was a no brainer. haha! Thanks! And thanks for stopping by! Your aversion to sports bars is the EXACT reason my husband doesn't like them, that and if his team is loosing he doesn't want to hear the other teams fans cheering. Funny thing, I don't like brats! And I'm part Polish! These chicken drumsticks could be good for your kids, they aren't terribly spicy and so much healthier than their fried counterparts that come with the sports bars! 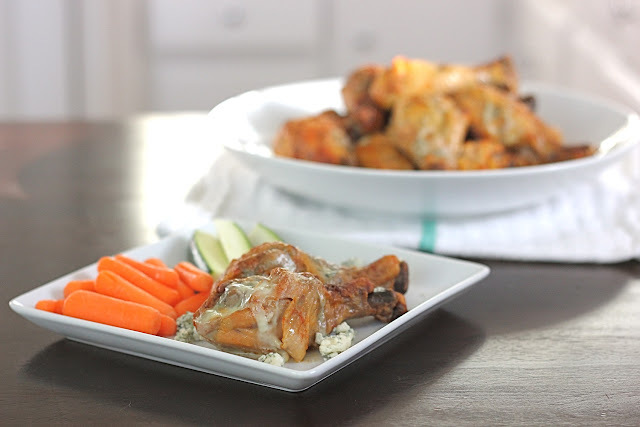 This recipe of buffalo drumsticks looks yummy and delish, I just can’t wait to try this one after we finish completing our kitchen appliances. I bet my husband would love this food!